Just 14 years after being built, our house has been declared legal and has been removed from the 'Kaya Valley Demolition List'. I've just spent a week of shuffling around the Foreigner Police, PTT, Council Offices, Noter, Kaya Muhtar, Council Offices again, PTT again, Kaya again, Council Offices again, and finally we've completed the process that the 'illegal building amnesty' has allowed the house we had built on our land to have a Habitation Certificate and to have its own TAPU. 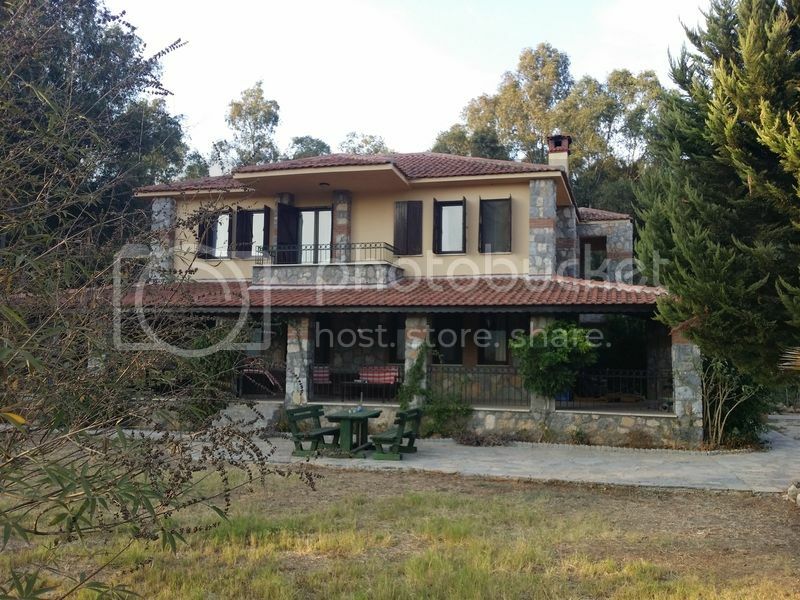 The property, a large, 3 bedroomed, family farmhouse of 380 square metres including the covered terrace on 8,500 square metres of mixed gardens and approximately 450 eucalyptus trees will be going on the open market in the next few days. If you're seriously interested in details of the property and its price, please feel free to contact me. That's great. Pleased to hear you've benefited from the amnesty. Villagers have been throwing up properties all over the village this year I'm told by people that live there. Yep. The whole village is a construction site. The trucks are using the forest roads that go up through Belen and then join the mountain road into Fethiye just as it levels out by the Yoruk Cemetary. They're doing that to avoid the Jandarma who are staked-out waiting for them at Karakeciler Camii. The normal suspension of building works during the tourist season have been dropped and replaced by a rule saying that work mustn't start before 8am or finish after 6pm. But, as usual, that's being ignored. Apparently, there were footings being poured at midnight on 2 sites in Belen this week. You know me Keith. I'd never even consider such a disgusting, underhand move like that. Well done KKOB. Sad you have to sell but hopefully it will sell easily and you can move on with life. Good luck. Council Offices again, and finally we've completed the process that the 'illegal building amnesty' has allowed the house we had built on our land to have a Habitation Certificate and to have its own TAPU. So did you not have a habitation certificate and tapu? I thought if you had those you would be legal. We had TAPUs for the 2 parcels of land. But, as Hanel Houses built the property illegally, we never got a Habitation Certificate, nor were the Council Taxes paid. It's cost us roughly £7,000 to get it all sorted out, but it's virtually doubled the value of the property.